Intestinal colonization of microbes immediately following birth is critical for establishment of the microbiota. The transference of microbiota occurs typically from mother to infant through vertical transmission of microbes during vaginal delivery or skin microbes following caesarian-section (C-section) delivery. The establishment of a diverse gut microbiota during birth is considered important for maintenance of overall health and well-being. The use of antibiotics during delivery has increased since the 1990’s to over 30% of births in the U.S. Their use during labor and delivery shifts maternal microbial balance and diversity leading to gut dysbiosis. Disruptions in maternal microbiota and early colonization may have long-lasting impacts including alterations in intestinal barrier function, immune system establishment and maturation, metabolic disorders and changes in neurodevelopment. Such changes have been linked to autism development. New research indicates that dysbiotic microbiota during gestation and delivery can be vertically transferred to offspring, and that certain important beneficial early colonizing commensals are irrevocably lost. Recent evidence from models also suggests early life dysbiosis detrimentally impacts the developing gut-brain axis and leads to neurodevelopmental and autism-relevant behavioral changes. Our overall hypothesis is that microbiota dysbiosis in gestation will perturb microbiota transfer to the offspring, leading to intestinal dysbiosis that contributes to intestinal pathology, inflammation, and and autism relevant behaviors. The long-term objectives are to assess whether the alteration of maternal microbiota will result in long-term changes in microbiota composition in the offspring, altered local intestinal barrier function, increased neuroinflammation and altered behavioral outcomes. The laboratory of Dr Quadros at SUNY Downstate Medical Center, Brooklyn, NY has been involved in investigating disorders of vitamin B12 and folate (vitamin B9) for the past several decades and has made seminal contributions towards our current understanding of pathways and genes involved. Folate is essential for fetal as well as neonatal brain development. Folate receptor alpha (FRα) is the primary transporter of folate across the placenta to the fetus and across the choroid plexus, to the brain. Autoantibodies (AuAb) against this protein are significantly associated with developmental disorders including autism spectrum disorders. Folinic acid treatment in these children has shown improvements in language and other core deficits. The neuro-developmental consequences of exposure to FRα antibodies (Ab) have been demonstrated in a rat model whereby pups exposed to the Ab during gestation and/or weaning have severe functional abnormalities such as socialization, communication, learning and cognitive deficits. These deficits were prevented by treatment with folinic acid. FRα autoimmune disorder is prevalent in families with an autistic child. Our goal is to investigate the heritability of the behavioral phenotype in FRαAb exposed rats to determine transgenerational transmission of the phenotype and devise strategies to prevent this. Up to four generations of rats will be assessed to determine germline and epigenomic transmission. Crossbreeding of affected and normal rats will be done to evaluate paternal, maternal and combined effects of transmission of the phenotype and the role of folinic acid treatment in preventing this. We will also evaluate transport of folate across the choroid plexus and the effect of an antibody to the FRα in disrupting this process. This pilot study will pave the way for genome-wide studies to understand the pathology and mechanisms involved and the role of folinic acid in preventing this. Richard E. Frye, M.D., Ph.D. “and Stepan Melnyk, Ph.D.
A large number of children with ASD likely suffer from mitochondria dysfunction, and this may be due to environmental exposure and/or physiological abnormalities. Furthermore, abnormalities in mitochondrial function have been documented in genetic syndromes associated with ASD. Preliminary data suggest that a significant subgroup of children with ASD have a unique type of mitochondrial dysfunction. The aim of our research proposal is to replicate these results as well as provide further understanding of this subgroup. We plan to do this by examining mitochondrial function on transformed B-cells rather than primary tissue from children with ASD. Once a valid subgroup is established, statistical tests will be used to compare clinical, behavioral and cognitive characteristics. Richard Frye, M.D., Ph.D. “and Stepan Melnyk, Ph.D. This proposal will employ state-of the-art metabolomics to investigate abnormalities in tryptophan metabolism in plasma from 157 children with ASD compared to 52 healthy typically developing controls. Preliminary evidence found that children with ASD and refreactory epilepsy had a unique metabolic peak identified as N-methyltryptamine that was not present in any of the control children or children with ASD without epilepsy. The investigators will expand on this finding with targeted metabolomics analysis focusing on the tryptophan pathway to define biomarkers unique to ASD and determine whether a unique biomarker is associated with specific ASD behaviors and/or refractory epilepsy. Given an excitatory/inhibitory imbalance which is manifested clinically as seizures or sensory abnormalities in individuals with ASD, the aim of this research project is to use different antibodies to calcium binding proteins to identify and help quantitate inhibitory neurons in the brains of individuals on the autism spectrum. If present, the presence of such an inhibitory deficit may help justify and guide future therapeutic interventions, such as transcranial magnetic stimulation. Autism Spectrum Disorder (ASD) is a group of clinically and etiologically diverse neurodevelopmental conditions characterized by restricted, repetitive behaviors or interests with deficits in communication and socialization. ASD is common, affecting 1 in 68 children in the U.S. Despite numerous studies from multiple disciplines, our understanding of ASD pathophysiology remains limited. Proteomics, the large-scale study of protein expression in cells or tissues, is a newer analytical technology that has been but sparsely applied for the investigation of the pathophysiology of developmental brain disorders, including autism. We performed the first global proteomic analysis of brains from persons with idiopathic ASD compared to age-, gender-, and post-mortem interval-matched controls using liquid chromatography tandem mass spectrometry (LC-MS/MS) in two brain regions: Brodmann area 19 (BA19) and left posterior inferior hemispheric cerebellum (CB). We identified 1807 proteins in BA19 and 1640 proteins in cerebellum. Of these, 210 and 221 were significantly differentially expressed between ASD and controls after controlling for age and post-mortem interval (p < 0.05). Gene ontology analysis highlighted several molecular themes including calcium binding, synaptic transmission, and cytoskeletal function. Network and pathway analysis revealed the presence of a major differentially expressed interaction network in each brain region: one related to synapse biology and glutamatergic neurotransmission in BA19 and one related to cytoskeletal function and vesicular transport in CB. Upstream regulator analysis showed enrichment for several proteins in both brain regions that have previously been implicated in neurodegenerative processes. Overall, this study, the first proteomic analysis of ASD brains, deepens our understanding of the brain biology in autism. We confirm earlier hypothesized dysregulated biological processes that were proposed on the basis of molecular genetic investigations such as disturbances of synapse biology. This work also provides new insights regarding the biology of ASD including, for example, insights regarding the dysregulation of key differentially expressed brain biochemical networks. Rafail Kushak, Ph.D., Dr. Sc. This proposal will test a new hypothesis suggesting that differences in the intestinal microbiota may underlie the well established male preponderance in ASD. Because intestinal microbiota is partially derived from the mother during vaginal birth, the microbiome of girls and boys with ASD and their mothers will be analyzed at the Pediatric GI and Nutrition Unit at Mass General Hospital. The microbiome of 24 boys with autism and 24 girls with autism from the same family and their parents will be compared with microbiome of 24 boys without autism and 24 girls without autism from the same family along with their mothers and fathers. This is the first study to examine the potential role of microbiota in etiology of the gender dimorphism of autism. The aim of this pilot study is to retrospectively review the medical records of 12, ASD patients with biopsy proven mitochondrial dysfunction, ages 6-25 years of age, followed by the Integrated Center for Child Development (ICCD) (Bauman) and by the Cleveland Clinic Foundation (Natowicz) with regard to their clinical presentation, laboratory studies including blood, genetic and histopathologic findings and with regard to their developmental and medical outcomes as the result of having received the mitochondrial cocktail and carnitine. If a positive correlation is determined, we would plan to conduct a prospective study involving a larger cohort of subjects. Specific Aim 1: To conduct a retrospective review of the medical and developmental records of 12 ASD patients, ages 6-25 years, with muscle/skin biopsy proven mitochondrial dysfunction, with regard to the presence of clinically defined symptoms that would distinguish them from children with essential ASD. We hypothesize that children, adolescents, and young adults with proven mitochondrial autism will exhibit clinically distinguishable features such as late independent walking, poor physical endurance, repeated regressions, recurrent illnesses with slow recovery, involvement of multiple organ systems, poor progress despite excellent services and/or growth failure. Specific Aim 2: To document medical and/or developmental changes that may occur following treatment with the mitochondrial cocktail and carnitine. We hypothesize that the majority of ASD children identified as having biopsy proven mitochondrial dysfunction, based on clinical features and abnormal laboratory studies, will show a measurable response to the mitochondrial cocktail and carnitine in terms of developmental progress and/or medical improvement. This grant will provide continuing support for a Phase I/II clincial trial that is designed to test the theory that the drug suramin will restore normal purinergic signalling in children with autism and will result in significant improvement of autism core symptoms. Preliminary results in a small double blind study demonstrated improvements in social interaction, language and novel interests. Using metabolomics, the proposal will examine the effect of suramin on 30 biochemical pathways known to be associated with cellular stress, and will test the theory that abnormal purinergic signaling maintains the “cell danger response” in children with autism and that when treated, significant improvements in the core symptoms of autism are possible. Harland Winter, M.D., Rafail Kushak, Ph.D., Tim Buie, M.D. This grant will support the continued enrollment of children with autism and neurotypical controls into the Harvard/MassGeneral Hospital’s biorepository of blood and gastrointestinal tissue samples. 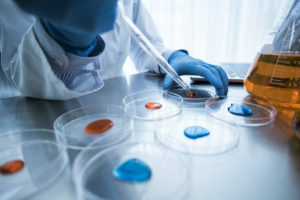 Samples will be used for their own research and shared with other researchers who are pursuing novel and creative approaches to understand causes of autism and potential treatment options. additional medical examiners at national and state association meetings and to educate the public and medical examiners about the critical importance of tissue donations from individuals with ASD and matching controls for continued research into the etiology of autism. The PI has previously demonstrated that the transcirption factor CREB and the protein kinase AKT are low in children with autism. In this proposal, the PI will determine or not zinc therapy in children with autism will significantly raise both AKT and CREB levels in plasma and whether this increase will be associated with improved autism symptom severity in 50 children with autism and 50 age/gender matched neurotypical children. This research project is designed to determine whether or not dysrugulation of MAPK/ERK pathways, specifically over-activation and under-activation in lymphocytes, can be associated specific sub-populations of autism based on symptom severity. The PI proposes to use a MAPK phosphorylation array to measure 17 pathway biomarkers and compare these marker concentrations with severity of 19 ASD symptoms. Jill James, Ph.D. and Stepan Melnyk, Ph.D.
other markers of protein damage. Positive results will provide a convenient marker for antioxidant treatment efficacy for protein damage.